Kyoto and kimonos go hand in hand. If you start your trip in Osaka, almost no-one is wearing a kimono, but once you get to Kyoto and especially Gion, it seems like every other woman is wearing one and some men are also in the trend. Kimonos have an image as something very expensive, but ichi·man·ben is a store that tries to change this. The store, located close to subway Karasuma Oike Station, began because the students of Kyoto University wanted a place where they could buy reasonably priced kimonos fit for the younger generation. Even some of the interior is made by students! So this kimono store offers these Japanese garments for reasonable prices, but read below if you’d like to know more. This kimono set costs only 10,800 yen, and some of these kimonos are made from silk! Because this is a set, you also get an obi with the kimono, obi being the kimono sash you tie to keep the kimono from unraveling. Many of the kimonos they sell are vintage, and have really interesting patterns on them. 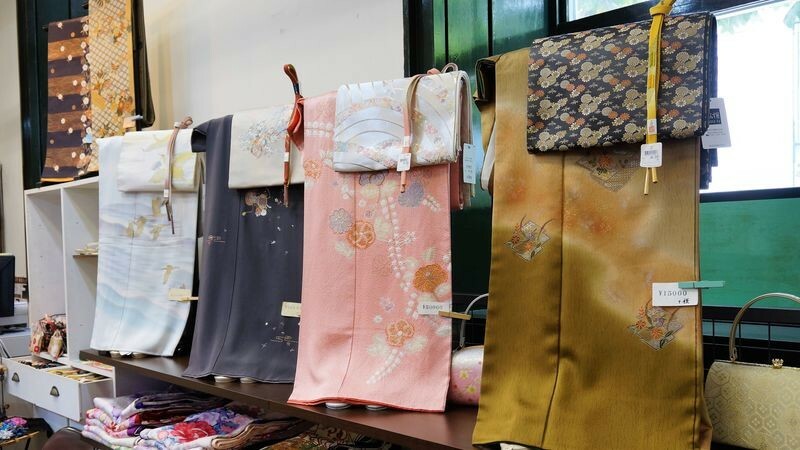 If you are getting a Kyoto-souvenir, is there anything more fitting for this ancient capital than a kimono? When the weather gets cold or it’s raining, you may wish to wear another layer. Luckily at Ichimanben they also sell haori-coats, so you won’t have to feel cold. They have many different color and pattern options, so you get to choose just the kind of haori you like. If you find a kimono you like, you can also try it on. They have instructions in English, Korean, and Chinese on how to wear a kimono, but it’s still a lot easier if you can get someone to show you how to do it. Often kimonos look a bit different when you are wearing them, so trying them on is really worth it. The staff can also help you choose a matching obi sash for your kimono. When buying a kimono, the size of the kimono is surprisingly important. And if you have no prior knowledge of kimonos, you should leave this to the pros, and just ask the staff. They are always ready to help you. Don’t eat or drink inside the store. The prices are not expensive but the kimonos are of great quality. They also give you instructions in English, Chinese, and Korean on how to wear a kimono, so you don’t need to worry about that. You can also try the kimono on first, so choose one you like, and try it on! Happy shopping! A 7-minute walk from subway Karasuma Oike Station. January 1 and possibly also December 31. When choosing your kimono size, remember to ask the staff first. VISA, MASTER, JCB, etc. / Accepted. You can buy your kimono tax-free, and the staff is very friendly. They can ship inside Japan. Overseas shipping is subject to negotiation.